“In God We Trust: Further Along the Spiritual Journey of a Patriotic Christian Convict” from Christian Faith Publishing author P.B. Turner is a purposeful account that contains the author’s life of toils and how God showed the way for healing and enlightenment. “In God We Trust: Further Along the Spiritual Journey of a Patriotic Christian Convict”: a defining narrative that chronicles the author’s circumstances in life that led to a deeper relationship with the Lord. “In God We Trust: Further Along the Spiritual Journey of a Patriotic Christian Convict” is the creation of published author, P.B. Turner, a lifelong business entrepreneur, a father of seven, and a devout Christian. Turner shares, “I was in shock. One day, I was running my own business, with my family and myself as the majority shareholders. The next day, I was someone looking at my business from the outside, facing criminal charges and possible jail time. I was also witnessing all of my hard-earned assets disappear into a legal morass over which I had zero control. And it was all due to what was certainly an error in judgment, but nothing that was criminal as deﬁned by the statutes of the United States government. "My wife and I were not prepared, however, for how God would turn this tragedy into triumph. After much prayer and soul searching, we decided the best course of action was to plead guilty to one felony charge and let God take over from there. It was a decision we will never regret. I experienced a seventy-week adventure in a federal prison camp that propelled my walk with God to levels I wish I had attained many years earlier. In prison, I teamed up with some of the ﬁnest and most mature Christians I have ever met. We cultivated our own church, expanded each other’s Biblical knowledge, and helped other inmates ﬁnd salvation through the loving grace of Jesus Christ our Lord. "This book describes in detail, month by month, my experiences in prison and my growing Christian worldview. I examined each month’s current events in the world and reﬂected on how Christians might react to them. My growing biblical knowledge strengthened my prayer life, and my conversations with the Holy Spirit convinced me that part of my Christian mission was to share with the world what you will read in this book. Published by Christian Faith Publishing, P.B. Turner’s new book is the author’s pure testament of God’s grace and goodness for those who seek his will and love. View a synopsis of “In God We Trust: Further Along the Spiritual Journey of a Patriotic Christian Convict” on YouTube. 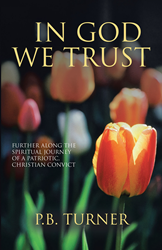 Consumers can purchase “In God We Trust: Further Along the Spiritual Journey of a Patriotic Christian Convict” at traditional brick & mortar bookstores, or online at Amazon.com, Apple iTunes store, or Barnes and Noble. For additional information or inquiries about “In God We Trust: Further Along the Spiritual Journey of a Patriotic Christian Convict”, contact the Christian Faith Publishing media department at 866-554-0919.